Eigenharp: the most revolutionary instrument in 60 years? 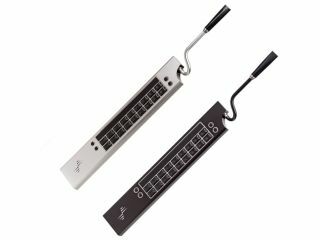 Eigenharp Pico: Will you be ditching your guitar/keyboard in favour of this? Eigenlabs' Eigenharp has been something of an enigma over the past few weeks, existing only in a smattering of YouTube videos. However, we now know a little more about this striking new device, which its manufacturer believes to be "the most revolutionary new musical instrument of the last 60 years." That's some claim, so what are we actually dealing with here? Well, we now know that there are two Eigenharps: the Alpha (pictured below), which, at £3,950, is probably going to appeal to professional Eigenharpists only (if such people even exist); and the Pico (in the gallery above), a £349 product that has more mainstream potential. Both instruments feature keys, a breath pipe and a strip controller and come with their own native soundsets. Thanks to their USB 2.0 connections, they can also play SoundFonts and Audio Unit/MIDI instruments (the Eigenharp is Mac-only at the moment). In addition, the Alpha sports a mic input/preamp and comes with a base station that can have a variety of pedals plugged into it (expression, sustain, volume, etc). For more detailed specs, we recommend that you check out the Eigenlabs website, but our feeling is that this is one of those instruments that you'll only fully appreciate once you've seen it being played (it's designed primarily for live performance, after all). Lucky for you, then, that MusicRadar is heading off to an Eigenharp launch event tomorrow - look out for video later in the week.